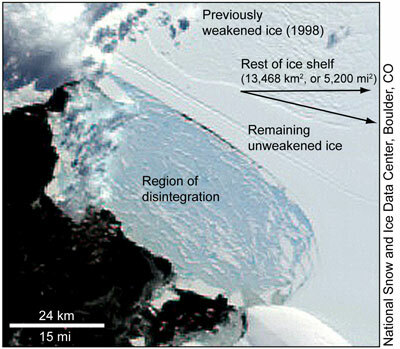 Satellites have captured the collapse of a massive ice shelf in Antarctica. At 160 square miles the area of collapsed ice was seven times the size of Manhattan. 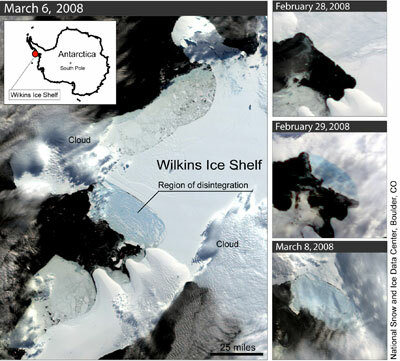 This image shows a high-resolution, enhanced-color image of the Wilkins Ice Shelf in Antarctica on March 8, 2008. 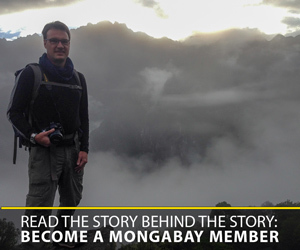 Narrow iceberg blocks (150 meters wide, or 492 feet) crumbled into house-sized rubble. Taiwan’s Formosat-2 satellite acquired this image. Credit: Left, National Snow and Ice Data Center; right, National Snow and Ice Data Center/courtesy Cheng-Chien Liu, National Cheng Kung University (NCKU), Taiwan and Taiwan’s National Space Organization (NSPO); processed at Earth Dynamic System Research Center at NCKU, Taiwan. Antarctic Temperature Trend 1982-2004. This image shows trends in skin temperatures–temperatures from roughly the top millimeter of the land or sea surface–not air temperatures. The data were collected by the Advanced Very High Resolution Radiometer (AVHRR) sensors that were flown on several National Oceanic and Atmospheric Administration (NOAA) satellites. The data come from the AVHRR’s thermal infrared channel–a portion of the light spectrum we can sense as heat but that human eyes cannot see. 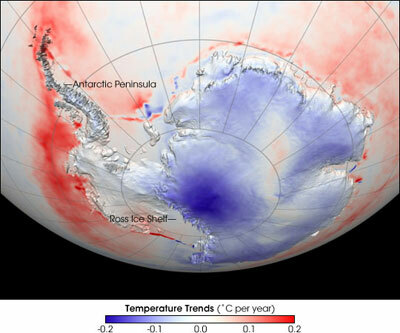 This image shows temperature trends for the icy continent from 1982 to 2004. Red indicates areas where temperatures generally increased during that period, and blue shows where temperatures predominantly decreased. NASA image based on data provided by Josefino Comiso, NASA-GSFC. Scientists say the collapse is the beginning of a “runaway” disintegration of the 13,680 square kilometer (5,282 square mile) Wilkins Ice Shelf on the southwest Antarctic Peninsula. The region has experienced the largest temperature increase on the planet over the past 50 years, rising by 0.5 degree Celsius (0.9 degree Fahrenheit) per decade. “We believe the Wilkins has been in place for at least a few hundred years. But warm air and exposure to ocean waves are causing a break-up,” said Ted Scambos, a scientist with the National Snow and Ice Data Center at the University of Colorado at Boulder (NSIDC). Scambos first spotted the disintegration via NASA’s Moderate Resolution Imaging Spectroradiometer (MODIS) and data from ICESat. While the collapse is dramatic, Scambos says it wouldn’t trigger a rise in sea levels since the Wilkins Ice Shelf is a plate of floating ice. Scambos adds that with the close of summer in the Antarctic, Wilkins is unlikely to further disintegrate in the next several months.